This morning I ran into an interesting problem. We have an office365 document library we’re using as a small scale CMS, where users are contributing documents and editing the attributes of those documents. PowerBI can then query the attributes in that document library to determine what has been contributed, and what is outstanding. As the project has been successful, we hit the 5000 document mark this morning. 5000 items is the limit for a document library. Effectively, once you’ve gone over that 5000 item limit, you can no longer sync the library. This limit is sneaky, as there are no warnings other than viewing the library content. The report used an OData feed, that never returned an error when the document library was over 5000 items. It just sat there and never finished. Anyone who has sync’d their desktop to the document library before it had reached 5000, would have a message in OneDrive for business that reads “We can’t sync this library because it’s too large”, any subsequent files would return the “We’re syncing your files but it’s taking longer than expected“. It turns out the only way to natively move these files and preserve the attributes, is to copy the files in the sharepoint admin from one document library to another. If done this way, the attributes will be preserved. 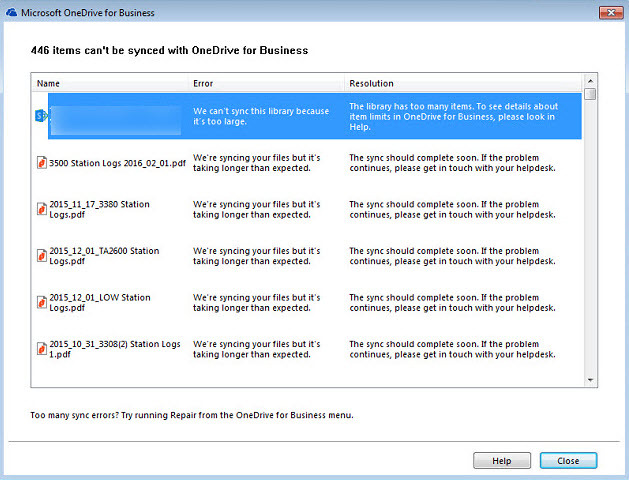 (Don’t copy files via explorer/Onedrive sync). Alternatively, if you had a document library that was less than 10 meg, you could save it up as a template, and restore it with another name. That will probably never happen, as the sheer size of the table of contents on 5000 files would itself probably come close to 10meg. Still looking for an easy solution. More to come. © Copyrights 2014. All Rights Reserved.